The purpose of the Recovery to Practice Next Steps training is to bring together peer support providers from a variety of places (geography, philosophy, training, lived experiences, educational backgrounds, and perspectives) to share the richness of their lived experiences as peer providers, learn with and from each other, and come to a common understanding of how to support people in recovery through some of the current best practices in peer support. The training was developed under the Substance Abuse and Mental Health Services Administration (SAMHSA) Recovery to Practice project as a continuing education opportunity for working providers of peer support services. The training was originally developed for peer support providers in the mental health system. However, skills and recovery principles practiced in this training also apply when supporting someone who is dealing with the effects of trauma, substance use, poor physical health, or multiple conditions. prior to attending this training. Because the practice of peer support in treatment and service settings is still new and evolving, the real experts are those who are face to face and learning with each individual they support about what works and what doesn’t work. The activities in the training draw on those work experiences and allow participants to share within a true peer group of working peer providers what they are finding to be most helpful. In this way, the training becomes a support network for the peer supporters and an “incubator” for best practices in peer support. Note: The workbook can be downloaded on this site (below) or ordered online. The full participant workbook is 175 pages. To download individual sections of the workbook click the links below. 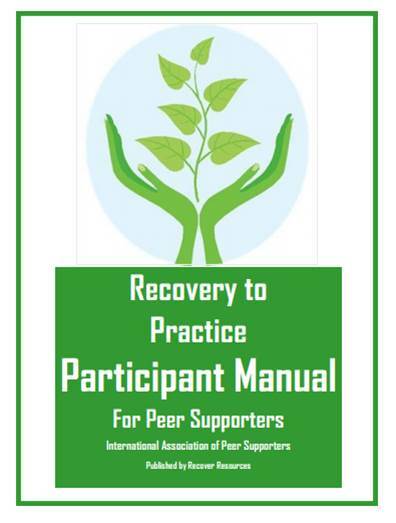 Note: The Participant Workbook is only one part of the full Recovery to Practice Next Steps training. The live (in-person) training is an adaptation of the Alternatives to Violence Project (AVP). To learn more about AVP, visit: http://avpusa.org/. Questions? Please contact us at training@naops.org. We are always looking for feedback to help us to improve! Does it accomplish the goal and objectives? Is the content relevant and accurate for a peer supporter? Are there any other resources you might recommend? Use this comment field to give general feedback about the workbook. For more detailed feedback, send email to steve@naops.org. Thanks! WOW! So beautifully, thoughtfully presented and researched, incorporating ideas we had from training. I’m off this afternoon til next Monday so only reviewed 4 modules so far, but I am so impressed. BTW, have you come across the Harvard trained social psychologist Sonja Lyubomirsky’s “The How of Happiness?” It’s for people who need more depth on the subject! For Module Two on Wellness: 1) Liked how the chapter is condensed now. 2) Liked the section that explains research. I think that is good information to know as a Peer. It shows how we can help the Peer Support field to expand. 3) Liked the section on Making Change Happen. Really relevant to Peers. In many states Peer Services are new and Peers are leaders who make change happen. 3) Like the section on Makign Change Happen. This is my favorite section of this chapter. There is alot of room for discsuuion on thsi section as in many states Peer Serivces are new and expandign fast. Peers are often leaders that make change happen. For Module 5 Moving From Dual Recovery to Recovery of the Whole Person: 1) I noticed that several of the sections are much more interactive such as the section on the four C’s of addiction and the Vincent Felitti article on Truama. I like how you made these sections interactive for the participants in the training. I think that will work really well an dhelp to understand hwo to talk abotu addiction with people Peers work with. I also liked how you moved those sections (ther four C’s and Vincent Felleti article) to the top of the module. I think that makes more sense than having those slides further down in the presentation. For more interactive activities, download my free toolkit at http://heartcircleconsulting.com! Here is a snapshot of me! My name is Keisha Nankoosingh. I am 32 years old. I am a mother of three beautiful children. I am a also a daughter, sister, aunt, friend, student and finally, an employee! I have been in recovery for 5 years after a 10 year battle resulting in desperation, hopelessness, and spiritual bankruptcy. In my addiction I was homeless, incarcerated, estranged from family and friends and honestly led a purposeless existence. Unfortunately my children experienced all of this with me. I was not a good mother, daughter, sister or friend. Prior to my surrender my children were placed with my mother (thank God), and I was given the opportunity to engage in treatment via the recommendation of the Judicial Diversion Program. Once engaged I began to flourish in my recovery. I followed through with all recommendations and graduated the program in November 2015. I have been active with the alumni program and part of planning committee since my completion. I have been involved in the Rochester recovery community in many ways and work hard to reach out to anyone who’s life has been affected by addiction. My support network continues to grow and I have been given countless opportunities to give back. I am not ashamed of my disease. Everything that my family and I went through before recovery happened for a reason. That reason is so I can let someone else know that “I have been there, done that, and got through it”. I believe that together, anything is possible. Today I live a life I never could’ve imagined. My relationships with family and friends have taken on a whole new meaning. I went back to school for Human Services, I recently received my CRPA-P (Certified Recovery Peer Advocate), and now I am employed by Syracuse Behavioral Health and Liberty Resources. My position is Peer Specialist in a brand new program called Recovery Resource Navigator. Our program will provide support to anyone trying to access services for addiction or mental help and their families. I work full time rotating the Rochester area emergency departments and on call. I am part of a team with includes another Peer Specialist, a Family Navigator and our Program Coordinator who ensures we are providing the best possible services. This position is incredible as it allows me to engage with people who are really struggling, offering them my experience, strength and hope. I am just so grateful. Keisha, What a beautiful story!! I sent an email to training@ naops.org and it was returned undeliverable, I was hoping to get more information about peer support training for the nonprofit organization that I work for in Florida. I have been in recovery for 24 years and would like to be a peer support specialist. I would love your training courses.